« Is R50 ceiling insulation bringing back the mouldy attic? 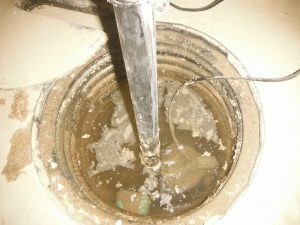 Sump systems are rearing their ugly head in many newly constructed houses. I often find them in a dysfunctional state, like the one in the photo . The water level was above the incoming pipe, and had been stagnant for so long (probably about two years) that a layer of mineral deposit had formed on the top. At the other end of the water spectrum, the sump basins are sometimes completely dry, indicating no water ever makes it to the basin. This could indicate dry conditions, or indicate poor installation of the foundation drainage piping. With the exception of specifying a lid that maintains the air barrier and is child-safe, sump details are absent from the Ontario Building Code, which allows the builder to install sumps however they see fit. The popularity of stepped foundations and walkout basements complicates the foundation drainage and sump installations. If any readers have experience installing foundation drainage on stepped foundations I am interested in your approach, as again OBC does not specify how to do this correctly.